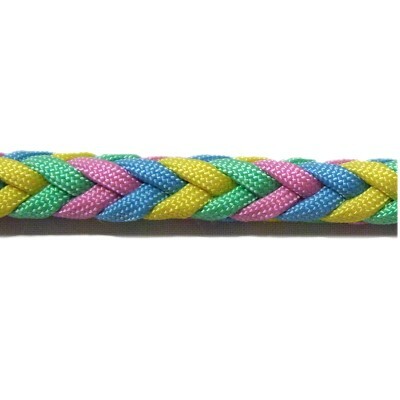 Description: The Herringbone Braid is a very unique rectangular design with four sides. It is not a flat design like a standard plait. 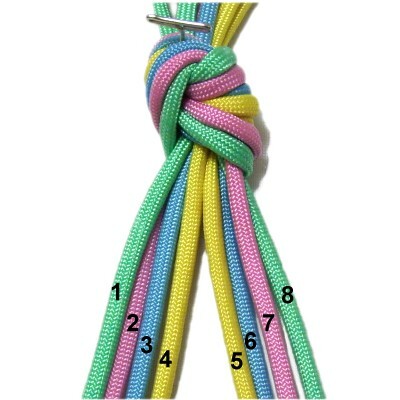 Like the Round Braids, there are crossed elements created by hooking the cord backward. 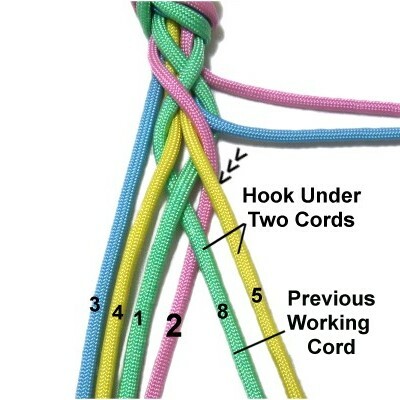 To see the pattern shown in the image above, set up the cords as described in step 1. They need to be in a specific order. 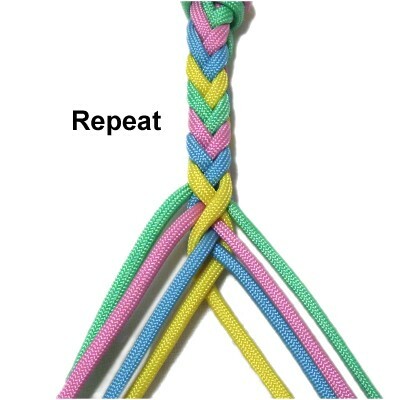 This type of braiding is suitable for many Macrame projects, including the long posts in plant hangers. To use it in jewelry designs, make it with fine, flexible material. 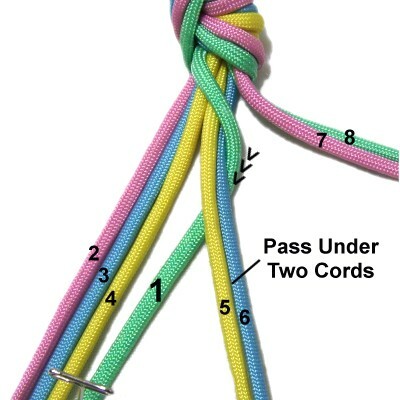 Since Paracord was used in the example, the braid was too firm to be used as a bracelet, but it would make a nice dog leash. 2018 Update: This page has been changed COMPLETELY, since I found a better way to explain the process. Please try to use this new version if you can, since it's much improved. Contact me if you need the original page. 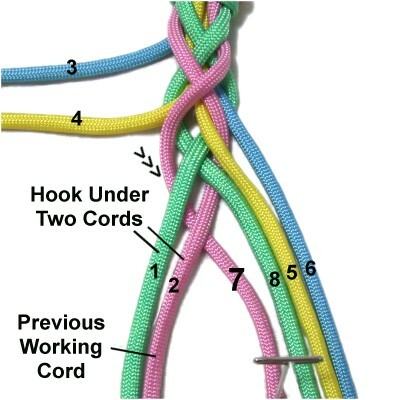 Preparation: To practice the Herringbone Braid, you need a total of 8 cords in four different colors, each at least 36 inches long. In other words, you need two cords per color. 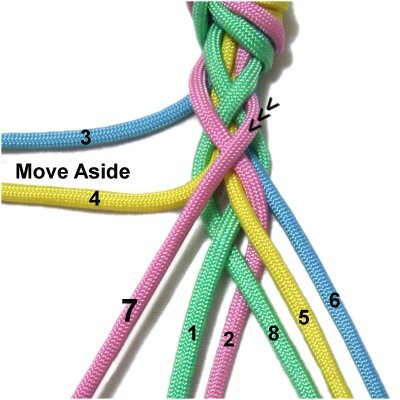 When using Paracord, you need to prepare it a certain way. Please read Cord Preparation if you have not used the material before. There is a section that explains the details (near the bottom of the page). 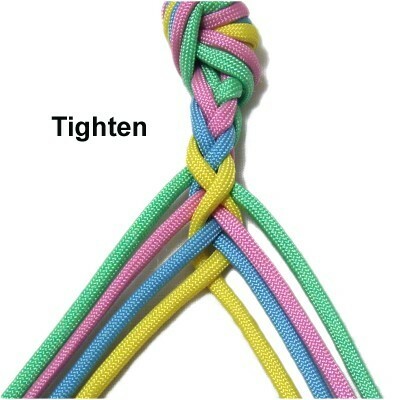 When using this braiding technique in a Macrame project, multiply the finished length you need by 3, and cut the cords to that length. 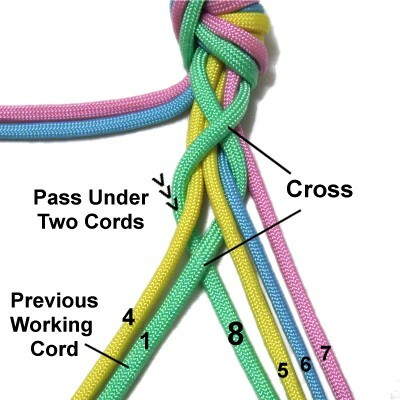 That gives you enough material for the Herringbone Braid, and two extra knots above and below it. 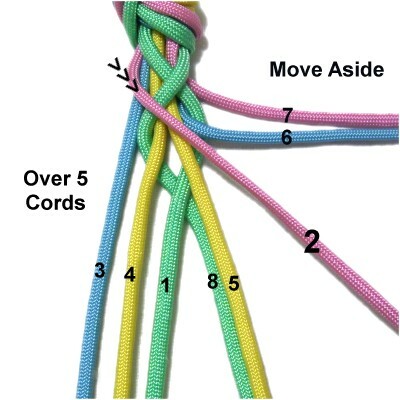 Step 1: Tie an Overhand Knot with all the cords in a bundle, close to one end. Secure it to your board. 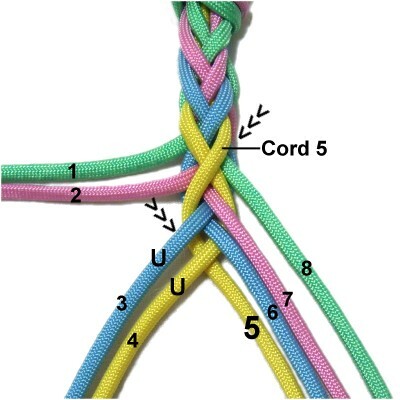 Organize the cords as shown, so the colors match from the center moving outward. Mentally label them. Step 2: Move cords 7 and 8 aside. Since cord 1 is furthest to the left, move it over the remaining five cords diagonally, heading right. Hook cord 1 back to the left, passing under the two cords closest to it (cords 5 and 6). Secure it next to cord 4. Move cords 8 and 7 back to their original position next to the other cords. Move cords 2 and 3 aside. Move cord 8 over the remaining five cords diagonally, heading left. 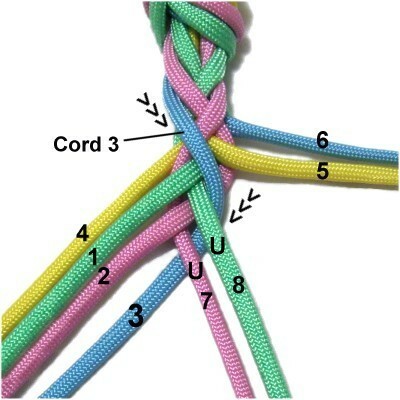 It will cross over cord 1, which is an important feature of the Herringbone Braid. Hook cord 8 to the right, passing under the two cords closest to it (cords 4 and 1). Secure it next to cord 5. Move cords 2 and 3 back to their original position next to the other cords. By moving two cords off to the side, you can then pass the working cord over the remainder without the need to remember their numbers. The two cords you move away should be the ones furthest from the current working cord. Always move the working cord over five cords in one direction, then move it back under two the opposite direction (hook). One of the cords it goes under should ALWAYS be the previous working cord. One step is completed after you have moved two cords (same color). The end result is a loop with two crossed areas (see previous image). Securing the working cord is optional, but it helps to identify it, so you can verify the next cord is passing under it. Step 3: Move cords 6 and 7 aside. 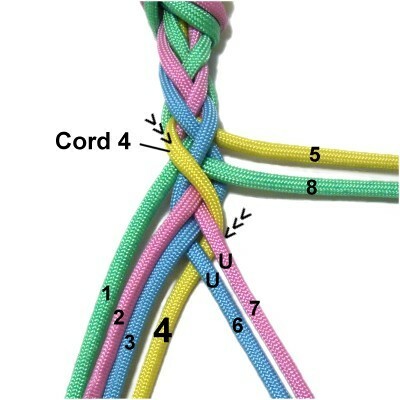 The cord furthest to the left is now cord 2, so move it over the remaining five cords, heading right. 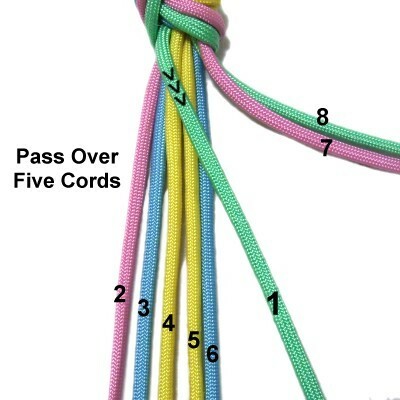 Hook cord 2 to the left, passing under cords 5 and 8. Cord 8 was the previous working cord. Secure it next to cord 1. Move cords 7 and 6 back to their original position. Move cords 3 and 4 aside. Cord 7 is furthest to the right, so move it over the remaining five cords, heading left. Hook cord 7 to the right, passing under cords 1 and 2. Cord 2 was the previous working cord. Secure it next to cord 8. Move cords 3 and 4 back to their original position. Step 4: Move cords 6 and 5 aside. Move cord 3 to the right, passing over the remaining five cords. Hook it back to the left, passing under cords 7 and 8. Secure it next to cord 2. Move cords 6 and 5 back to their original position. Move cords 4 and 1 aside. Move cord 6 to the left, passing over the remaining five cords. Hook it back to the right, passing under cords 3 and 2. Secure it next to cord 7. Move cords 4 and 1 back to their original position. Step 5: Move cords 5 and 8 aside. Move cord 4 to the right, passing over the remaining five cords. Hook it back to the left, passing under cords 7 and 6. Secure it next to cord 3. Move cords 5 and 8 back to their original position. Move cords 1 and 2 aside. Move cord 5 to the left, passing over the remaining five cords. Hook it back to the right, passing under cords 3 and 4. Secure it next to cord 5. All the cords should now be in their original positions (step 1). 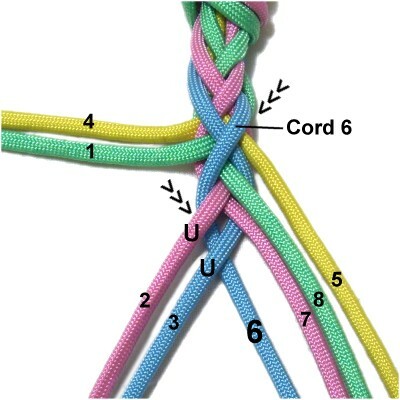 Tighten the Herringbone Braid by pulling on each cord in order, starting with cord 1 (left to right). The crossed areas should be close together. Make sure the cords are still in order when you are finished. Step 6: Repeat steps 2 - 5 at least one more time if you are practicing. When using the Herringbone Braid in a project, you would continue until you reach the finished length you were planning to make. 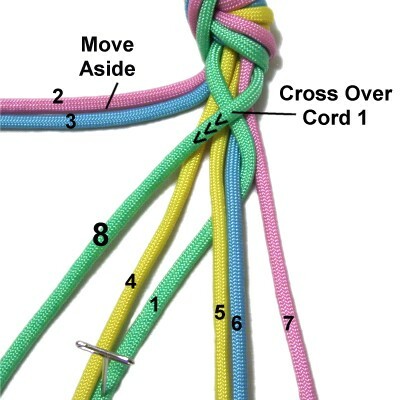 Step 7: Tie some type of finishing knot to secure the braid. 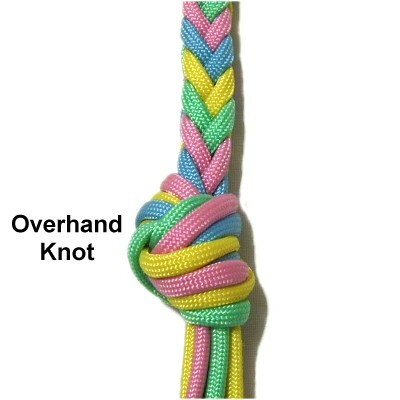 When practicing, an Overhand knot is a good choice, since it matches the opposite end. Have any comments about the Herringbone Braid? Contact Me.